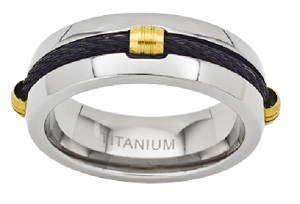 This striking mens titanium cable ring combines the strength and clean lines of polished titanium with the ruggedness of a black cable running through the center. 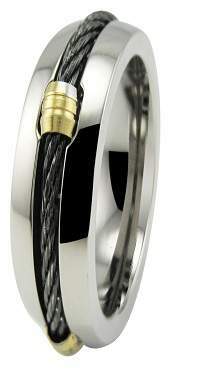 But what really makes this ring sensational are four contrasting gold-plated accents that grasp the cable. Men love this stylish 8mm ring for its natural sophistication and designer good looks. Choose this ring as either a fashion ring or a wedding band, and you will see how quickly it turns heads!